Cap depressed to funnel-shaped, velvety or tomentose, later smooth, cap margin inrolled and remaining so for a long time. Gills forking. Spore print rusty, brownish or vinaceous. At least eight species are described in Europe. With exception of Paxillus rubicundulus, that is relatively easy to recognize, the rest of the species gravitate closely around Paxillus involutus. The colour of the spore print is thought to be important for the species recognition, so it should be thoroughly noted when freshly deposited. The crystal that occur in the rhizomorphs are also considered important so any Paxillus collection must contain fruitbodies with preserved basal mycelium. Reaction with ammonia solution is used to separate some of the species. It has been proven in other bolete genera that the ammonia reaction has little (if any) taxonomic value. However, it has not been evaluated in Paxillus and it should be tested systematically. Cap up to 10 cm, depressed to funnel shaped, smooth to velvety or scaly, ochraceous, ochraceous brown, yellowish brown, reddish brown or rusty, often with reddish hues, cap margin tomentose to smooth, more or less inrolled. Stipe cylindrical, not exuding droplets at the base. 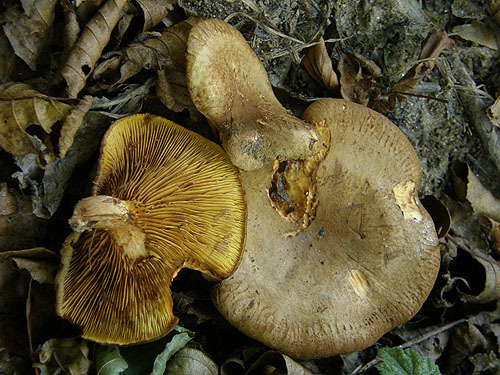 Gills forking, pale ochraceous, more brownish at maturity, bruising reddish. 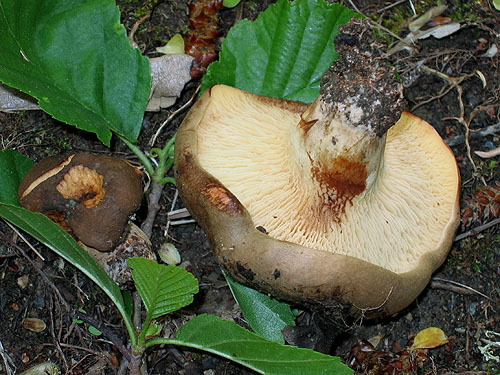 Flesh pale yellowish, turning more reddish when exposed to air. Spore print pale rusty. 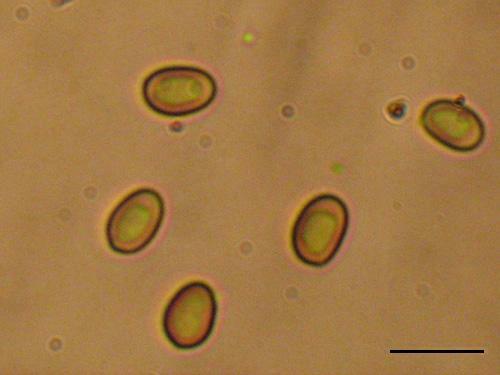 Spores 5.5–8.5 × 4–5 μm. Cap cuticle of hyphae mostly broader than 5 μm. Habitat. Along river banks and in alder thickets, mycorrhizal with alders (Alnus). Distribution. In Europe widespread, but uncommon, possibly due to the rarity of the preferred habitat. Similarity. Similar to the other species of the genus, but recognized due to its mycorrhizal association with alder and the small spores. Note. Some authors prefer using the name Paxillus filamentosus for this species. Henrici, A. 2004. A key to Paxillus s. l. in Europe. – Field Mycology 5(3): 87–88. Šutara, J. 1992. The genera Paxillus and Tapinella in Central Europe. – Ceská Mykologie 46: 50–56.